Not much remains of Site 59 at Carrowmore. No. 58. Situated 30 paces to the N.E. 57 (dolmen-circle). "This circle is entirely destroyed, but the supporting-stones of the cromleac, seven in number, remain." - Petrie. This monument "consists of an oblong cist, or enclosure, which was probably at one time covered. If it were ever surrounded by a circle, it has been long since destroyed. This site was most carefully searched, yet no fragments of bone could the discovered, neither were there any signs of charcoal. A flint flake, or knife, was here unearthed, but its point was missing." - Wood-Martin. The remaining stones of Site 59 at Carrowmore. From the plan, the monument seems to be 20 feet long, from out to out, and the longer axis of the chamber northwest and southeast. 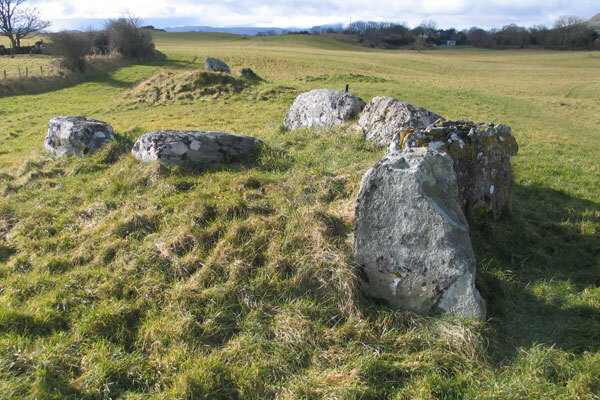 Four or five stones at the S.E. 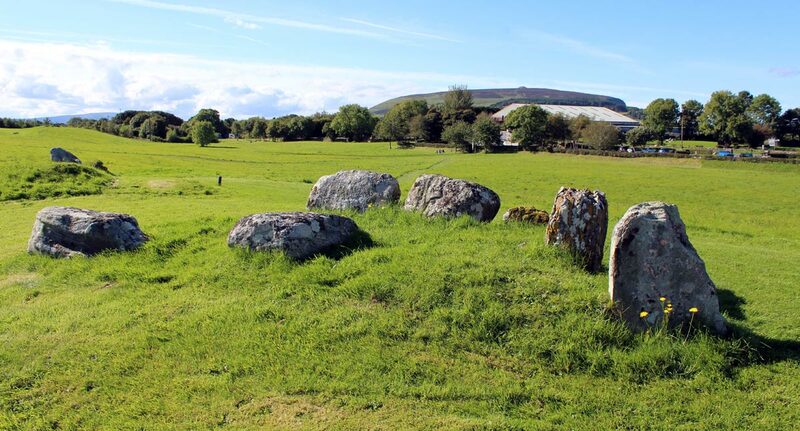 end look as if they had formed portion of such an oval enclosure as surrounds monuments such as the Leaba-na-Callighe in Cork, to which class, rather than to that of the dolmen-circle, this structure possibly belongs. No. 59. 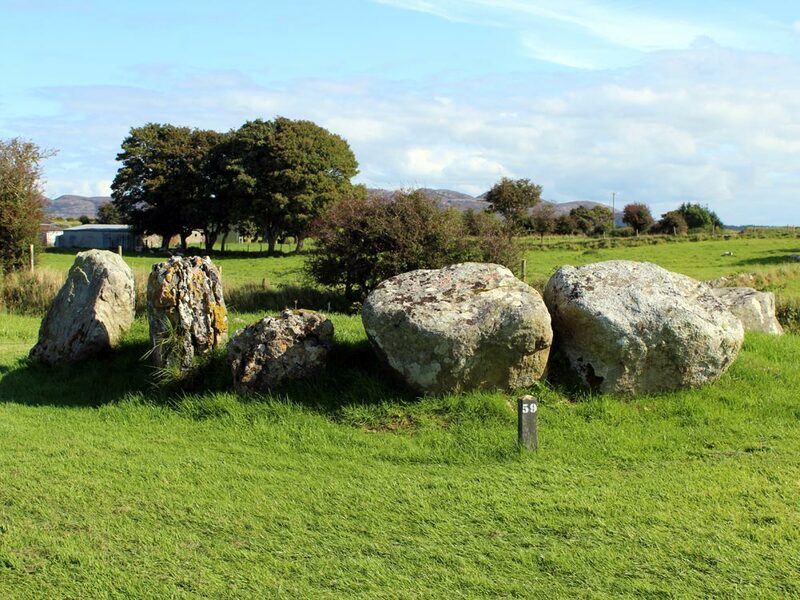 Situated a few paces to the east of the preceding (dolmen-circle). "In this instance the circle is also absent. The supporting-stones of the cromleac remain. They consist of nine stones, and are arranged in a circle [a feature which, however, does not appear in Col. Wood-Martin's plan]. This is the last of the series of these monuments of which I could find any distinct traces." - Petrie. This monument seems to have been originally a rectangular cist, of which four side stones alone remain in situ. Its longer axis is about north-northeast and south-southwest. Remains of human bones were found only under and about one of the fallen side slabs (second from bottom of plan, east side of cist). The position of these was enough to show that the usual plan of cremation or torrefaction of the dead (that, at least, which was practised in the case of 52) had also obtained here." Site 58 may be the remains of a wedge monument. Two small fragments of worked bone were discovered, which had been evidently the head or termination of some object or objects. One of them resembled the semicircular piece of bone found in No. 1. There was also a fragment of a very white and highly calcined object with a sharply incised hole, not, however, penetrating quite through. It might be semi-opal, or hydrated silica. (a) 2.5 lbs. weight of greyish-white bones, seemingly calcined: amongst them were fragments of those of birds and animals, some showing a dark-blue colour (vivinnite) on the inside. (b) Small finger-tops, probably those of a young person or child, a tooth of a child, and also one of an adult. (c) Fragment of calcined cranium. (d) Some bones of a dog, a fragment of a lower jaw, and other animal remains of a peculiar white colour. (e) A few uncalcined bones. (f) Four pieces of fractured white quartz, the two largest weighing 2 oz. and 1.5 oz. respectively. (g) Two specimens of Cyathophyllum, a fossil coral from the Sligo limestone. - Wood Martin. According to the plan, this monument probably measured about 20 feet in length. View to the south over Carrowmore circles 56 and 57, illustrated by Wakeman. The hills of Croughan and Doomore, each with a neolithic cairn on its summit,are on the horizon. Image © County Sligo Library.